Only 4 V10 plus models left in stock! The new Audi R8 Coupe shares many similarities with the Audi R8 GT3 LMS. Teams from the motorsports and production worked hand-in-hand, sharing just under 50% of the same parts as the R8 GT3 LMS race car. The main attraction of the R8 is the 5.2-liter V10 FSI(R) engine, which produces 540 hp of power and 398 lb-ft of torque. Taking it up a notch, the R8 V10 plus cranks out 610 hp and 413 lb-ft of torque. The R8 Coupe features a unique application of quattro(R), which emulates a rear-wheel drive vehicle, but with the ability to send up to 100% of available torque to the front axle, depending on the driving situation. This is made possible by advanced technologies, like the electronically controlled hydraulic multi-plate clutch, the addition of torque vectoring and quattro(R) integration within the Audi drive select system. 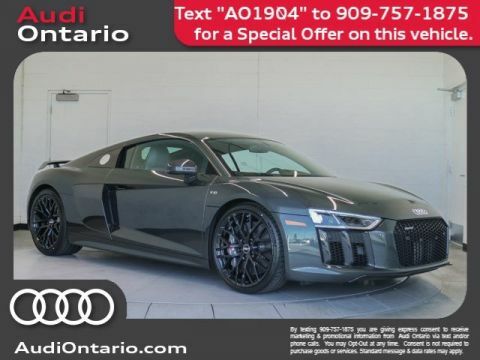 Audi drive select on the Audi R8 Coupe lets you choose between a range of variable handling settings through control of the quattro(R) all-wheel drive system and other drivetrain and running gear components. Select your preference from up to five modes: Comfort, Auto, Dynamic, Individual and, on R8 V10 plus models, Performance. Audi magnetic ride adjusts the firmness of the dampers through an electronically charged magnetic fluid within the shock absorber. Dynamic, Comfort and Auto settings are available via Audi drive select. The GT-inspired allure of the Audi R8 Coupe epitomizes performance art. The mid-engine concept provides the basis for the design of the R8 Coupe, encasing the engine in artful glass. Full LED headlights make a strong first impression, while the trapezoidal exhaust outlets and prominent wheel arches showcase its refined racing pedigree. The track-tested DNA is felt as soon as you enter the interior of the R8 Coupe. From the monoposto arc that's reminiscent of a race car driver's cockpit to the multifunction steering wheel with shift paddles and satellite controls, the R8 Coupe showcases its motorsport heritage on every drive. The standard MMI(R) Navigation plus system provides available Audi connect(R), enabling Google Earth? with 3D satellite imagery, a Wi-Fi hotspot, local traffic and weather, flight information, news and more. Also standard, MMI(R) touch with handwriting-recognition technology allows the driver to write their entry rather than selecting letters or numbers and more easily navigate maps by moving a finger across the touchpad. The Audi virtual cockpit is a fully digital 12.3-inch instrument display that allows the driver to customize information such as navigation and audio, offering Classic and Infotainment modes as well as Google Earth?. 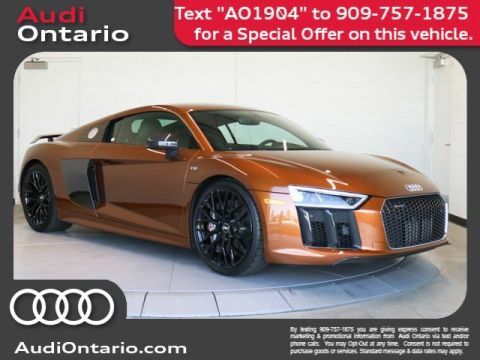 The R8 Coupe has a third option: Sport mode, which displays a large, central tachometer and performance statistics, such as a lap timer, horsepower and torque gauge, G-meter, tire pressures and temperatures. You can connect your Audi to your world with Audi connect(R), an intuitive system that integrates sought after information like Google Earth?, weather conditions and traffic information. 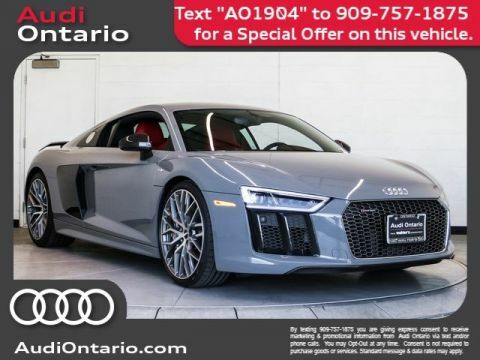 The Audi R8 Coupe comes standard with a six-month trial subscription to Audi connect(R), a Wi-Fi hotspot and more. Combined with in-vehicle 4G LTE connectivity, getting connected has never been easier. The Parking system plus with rear view camera feature uses front and rear acoustic sensors to help detect when you are close to another object, while a rear view camera helps provide additional visibility when backing up. 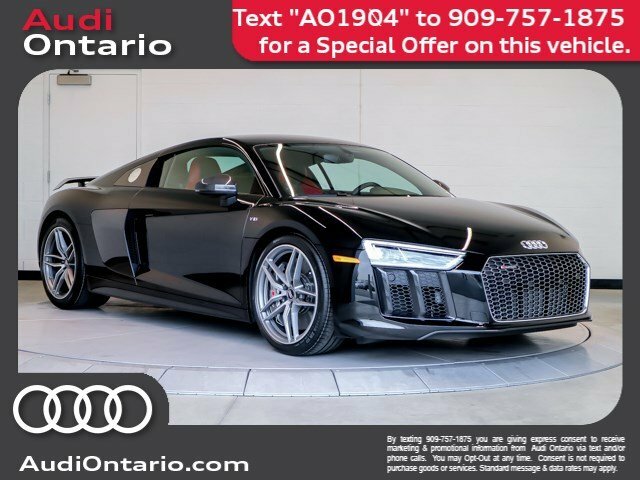 Let us show you all of the impressive features of the new 2018 Audi R8 in person today at Audi Ontario located at 2272 E. Inland Empire Blvd., Ontario, CA 91764.